Since the beginning of my CB career (2000ish) I've noticed a worrying depletion in the amount of Cornish CB users accessible to chat with in the Lizard Peninsula area. Mostly I associate this problem with the fact that I have moved and don't live on a hill anymore, but to be frank, what is troubling me is that the regulars who used to use the CB seem to have either died, or left. I am wondering, are there any parts of the county in particular that thrive with CB activity? 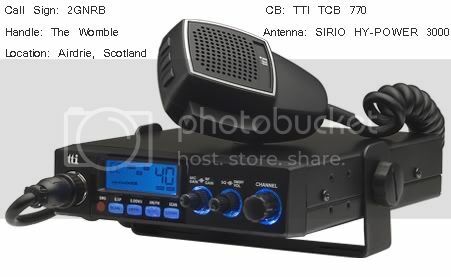 For example, I have never taken my Midland 42 to a city, and going on a long jaunt this summer, I would love to take the time to visit some hives of CB activity. You could call this sadness, but I have rarely had a good chat in the previous two years. Is anyone aware of "honeypots" of activity in the country? I realise my post makes little sense. I live in Chatham and we have a lot of activity around here and also up into London and over into Essex. I used to live in Cornwall. Longstone, just up from Bodmin. Great DX upto Wales, Scotland, USA occasionally (back in '81 or so)! Also for Poland, oddly... I've hit poland a few times. But my Polish is abysmal, so limited conversation! Hi Basilparents, did you hit Poland with your Excalibur? No, I hit it with the handheld, when I used to live on a hill... a Midland 42. I haven't really had much play with my excalibur, as as soon as I got it mounted on the outside of my house (after a long battle with my mother) my Fidelity homebase seems to have given up the ghost... or so I think. Today I have a free day, so I am going to attempt to switch it with the York.